Panasonic HDC-TM700 is a hot AVCHD camcorder with functions to record 1080/60p and 1080/50p videos with 28Mbps as bit rate for high quality display. Another impressive function is the picture adjustment options to make color tone hotter or cooler with WB shift color depth setting. Even though Sony PlayStation 3 plays most native 1080 60p files flawlessly, there are still some AVCHD MTS files with picture adjustment that do not play smoothly on PS3. How do you make the 1080/60p videos from Panasonic TM700 with picture adjustment playable on PS3? I find Aunsoft Video Converter for Mac a top-rated Mac Panasonic video converter that supports importing 1080/60p 28Mbps and converts TM700 MTS to MP4 for PS3 with smooth playback. Here I would like demonstrate the steps to make Panasonic TM700K 1080/60p to PS3, which is hooked to HDTV. Let's have a look at the video format supported by PlayStation 3: .mp4 with H.264/MPEG-4 AVC, .mpg with MPEG-1 and MPEG-2, .avi with Motion JPEG, .m2ts/mts. Step 1. 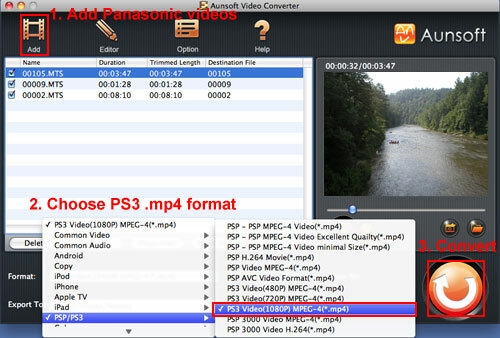 Load Panasonic videos to Aunsoft Video Converter for Mac. Transfer Panasonic HDC-TM700 .mts files from camcorder to iMac hard drive via USB cable. Run Aunsoft Video Converter for Mac as the best Mac Panasonic TM700 to PS3 converter, and click the "Add" button to load 1080/60p or 1080/50p 28Mbps .mts videos for conversion. Step 2. Choose PS3 MP4 format. Click the "Format" option, and choose PSP/PS3 > PS3 Video(1080P) MPEG-4(*.mp4) as output format. The Mac Panasonic video converter will transcode MTS to for converting MTS videos to MP4 in original resolution 1920x1080. Step 3. Convert Panasonic 60p or 50p 28Mbps video to MP4 for PS3. Click the convert button under the preview window, and the conversion from Panasonic TM700 video to PS3 MP4 for perfect playback. Wait for a while, and after the conversion, you can place the videos on an external hard drive and watch videos on TV with PS3 hooked. 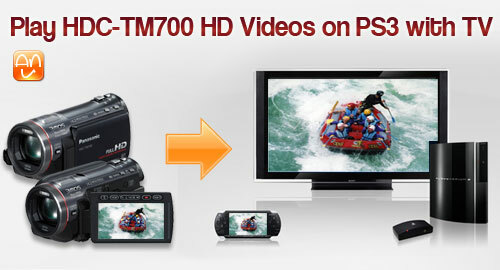 You shall play TM700 HD videos even with picture adjustments. 1. The Mac Panasonic video converter enables you to change video bit rate and frame rate. If you want to specify the bit rate and frame rate, you can change a different output profile in Step 2 like Common Video > H.264 Video(*.mp4), and then click the "Settings" button to change the frame rate to 24 or 30, or change bit rate to 17Mbps, 24Mbps as you like. 2. If you want use your Windows computer for conversion, you may free download the Panasonic HD video converter with the same function like the Mac converter. You can also make TiVo, MKV, RMVB, RM playable on PS3 with the converter.